Until I made these Smoky Jalapeño Poppers, I'd never used more than one or two jalapeño in a recipe at a time. Oh, I'd minced one to add to my guacamole or thinly sliced a couple into my spicy artichoke dip, but I'd never had to work my way through a full bag of them. And because of this, I seriously (seriously) underestimated their heat. To put it bluntly, these peppers burn. I figured this out somewhere around my eighth pepper. I'd been calmly slicing into the gorgeous little green babies with my paring knife and then sliding my bare pointer finger into the small opening in order to pluck out the core of seeds. The work was tedious, but calming. At least until I noticed the weird sensation on the sides of my hands. I tried washing them, but the feeling only intensified. Soon my hands were red and hot to the touch, and no amount of scrubbing or lathering would make it stop. I have to tell you, it's an incredibly frustrating sensation to have your hands feel as if they're on fire when they clearly are not. I kept staring at them, wondering if perhaps I was spontaneously human combusting. In a flash of inspiration, I remembered the bottle of chilled lidocaine I had sitting in the fridge since our trip to Aruba a couple months ago (where Eugene got an entirely kind of burn). I slathered a generous amount of the cool numbing cream onto my hands and reveled in the instant relief. Despite the sacrificed skin cells, the jalapeño poppers came out fantastic: golden and crisp on the outside with a creamy and gooey (and spicy!) center. The combination of cheeses and the smoked paprika in this recipe elevated these classic bar snacks to something a little bit more elegant that the usual TGI Fridays version. Oh and if you have leftovers, they can be frozen and then reheated in a 400 degree oven for about 5 minutes. They won't be as awesome as at first, but still pretty good. Insert your (gloved!) fingertip through the top of the opening and gently wiggle the core loose, then remove. Rinse under cold water to remove any additional seeds. Pat dry gently with a paper or clean towel, and set aside. Repeat with each pepper. Once the peppers have been seeded, combine the cheddar, asiago, cream cheese, and tabasco until smooth and well blended. Use a spoon to scoop gently nudge the cheese filling into the peppers. Once full, close the open pepper and squeeze gently to bring it back to its original shape. Don't worry if the pepper tears a bit, just squeeze it shut. In a shallow bowl, combine the breadcrumbs with the salt, pepper, and smoked paprika and sift well. In a separate shallow bowl, lightly beat the three eggs. 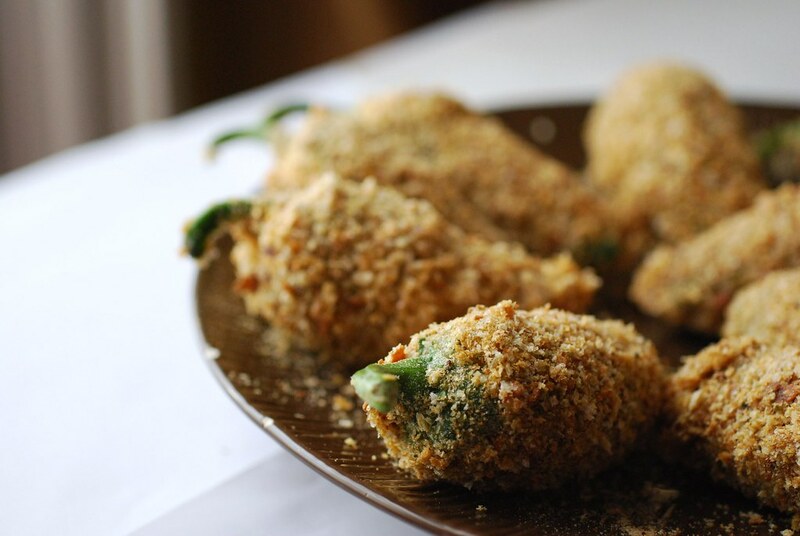 Holding each pepper by its stem, lightly bathe it in the egg and then coat with the seasoned breadcrumb mixture. Don't worry if the breadcrumbs don't stick completely; this is only the first dunk. Do this for each pepper and then repeat one more time so that each pepper gets two coatings of eggs and breadcrumbs each. Set on a plate to dry slightly. In the meantime, pour about 2 1/2 inches of oil (such as canola) into a heavy bottomed cast iron skillet or Dutch oven and heat to 325 degrees F. When the oil is hot, fry the peppers in batches of 3 or 4, making sure not to crowd your pan. Keep an eye on the heat of the oil and adjust as necessary so that it stays steady. When the first batch is golden (about 5 minutes), remove to a paper towel-lined platter to drain and repeat with the remaining peppers. Toss a quick sprinkle of salt over the freshly fried peppers and serve immediately. Any leftovers should be frozen flat and then stored in a freezer bag. Reheat in a 400 degree F oven for 5 minutes. That burning can be terrible, and I always forget and rub an eye. Looks like it was worth it though. These look delicious! i like the photos. there is no way i could eat more than one of these though. some hot foods i can handle, like korean food, but whole chiles in any form really kill me for whatever reason. these are one of my favorite things! I get them at Jack in the Box occasionally. 8?! I'm impressed! :) These sound delicious! 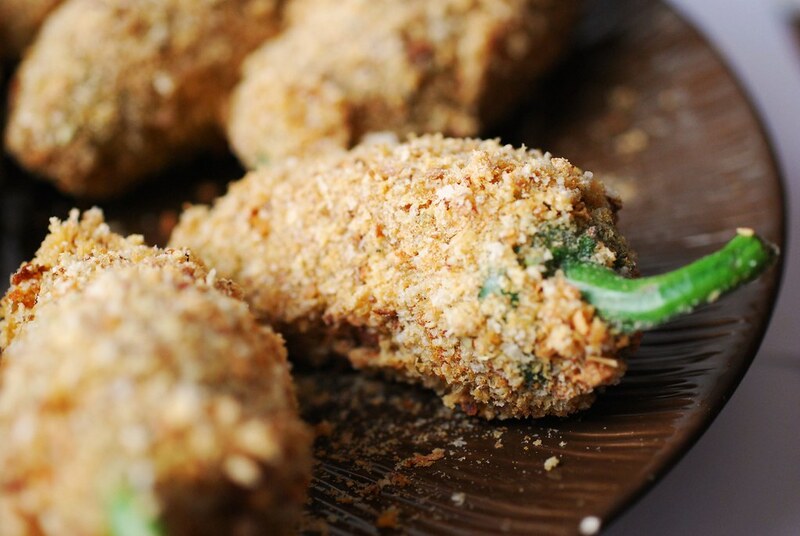 I just had some jalapeno poppers last night at dinner, but these look way better than what I ate. Looks fantastic! These look really delicious! The last time I made stuffed jaleapenos my fingers were burning so badly that I missed a few seeds. It was like playing Russian Roulette when eating them! (I think it's the first time I've seen my brother in law cry.. =) ). Gloves are a must have for me too! These look waaaaay better than the restaurant chain versions I've eaten. I'm a huge fan of jalapeno poppers and have also suffered the fate of the dreaded burning pepper fingers. I've tried making these before on several occasions with less than stellar results. This recipe looks like a home run.